Javlins are exo suits the heroes in Anthem wear. Your choice of Javelin will determine your class, so it’s important to think carefully before you decide. You will have the ability to change javelins between missions, so you can tackle any challenge in the game any way you like, but once you’re on an expedition, you’ll have to see it through. If you’re wondering how to change javelin suit in Anthem, this guide will show you where to look in Fort Tarsis, and how to switch classes. How to change class in Anthem? Once you’re in Fort Tarsis, go to the forge – the gray console near your launch pad. Interact with it to open up the javelin menu. You’ll see a button prompt in the lower left corner, which will allow you to view your list of javelins (on PC, it’s “R”). 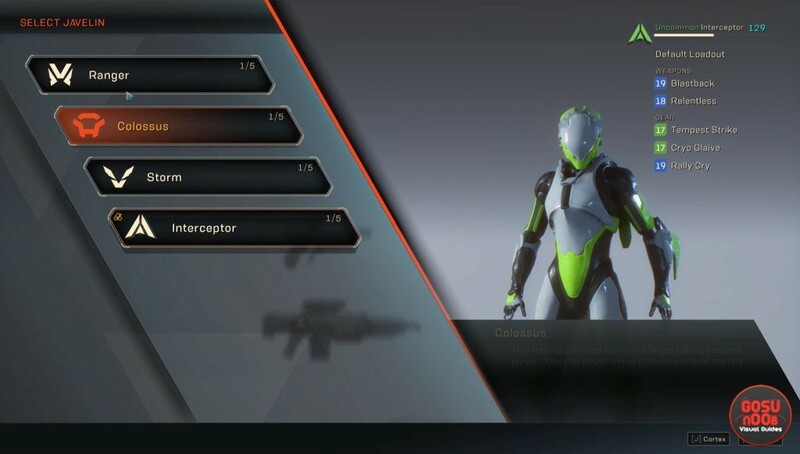 The first screen you see after you press it will let you choose the class – ranger, storm, colossus or interceptor. Once you’ve selected a class, you’ll also be allowed to choose a loadout. Nothing is set in stone. Your choice of javelin might not only depend on your play style, but also the mission requirements or who you’re playing with. If you’re teaming up with a squad that needs a tank, you’ll want to pick a colossus, even if you generally prefer the ranger. If you’re going in solo, you’ll want a versatile class that doesn’t exceed at anything, but also doesn’t have any glaring weak spots. It’s a balancing act, and you’ll probably want to change your class often. Thankfully, it’s an easy process, and it doesn’t take a lot of time. It might’ve been better if there were no restrictions on changing, but they do make sense – you wouldn’t think about changing your exo-suit out in the field, while under heavy fire.